hearing, hearing loss, counseling, hearing aids. Introduction: Different informations are transmitted to the new user of the hearing aid, in a short period of time. The user needs to understand and retain the information to subsequent recovery and action, ensuring the proper use of the device. Objective: check the information retention about the hearing loss and use/care with the hearing aid in new users of these devices. Examine whether there is influence of demographic data and audiologic. Method: Prospective study. Participants: 30 hearing impaired (18 women and 12 men), aged between 18 and 88 years. Were offered verbal orientation supported with ilustrations at the time of audiological diagnosis and adaptation of the hearing aid. There was practice for manipulation of the prosthesis. Three weeks after the adaptation, was performed a evaluation of the retention of information about hearing loss (free recall) and use/care with the prosthesis (aided recall). The manipulation of the prosthesis was also evaluated. The responses and comments of the evaluator were noted in a specific protocol and scored. Results: On average the participants retained, respectively, 31,6% and 83,6% of informations about hearing loss in adults and elderly. 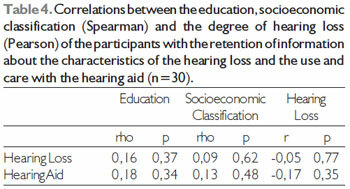 There was no correlation between the retention of information with the degree in hearing loss, education and socioeconomic level. Conclusion: It's necessary the use of strategies that facilitate and improve the retention of the information about the audiological diagnosis, use and care with the hearing aid for new users of this device. Provide counseling to clients and their family and/or caretakers it is one of areas of competence of the speech therapist. The counseling is a opportunity of receive and provide information in a way to facilitate the understanding of the hearing impairment and the adjustment of this condition. In a general way two types of counseling can be offered, being both important and the process of adaptation of the hearing aid: (1) personal adjustment, which involve the development of mechanisms and emotional support systems for the individual to deal with the deficiency and (2) informative, here considered as synonymous of "orientation" (1). Regarding the orientation is suggested an approach of the following topics: anatomy-physiology of hearing; nature of the different types of hearing impairments; general characteristics of hearing aids and the explanation of the motives that guided the selection of a type of prosthesis in particular; instructions about the use, care and resolution of problems with the hearing aids and the earmold; instruction about the use of telephone and auxiliary equipment, when pertinent; recommendations to the consults of accompaniment of grown-ups and orientation about the expectations to the use of hearing aids (2,3). Also is emphasized the importance of manual demonstrations of how to operate the hearing aid (4). Those information are important to assure the appropriate use of hearing aids and maintain the good functioning of the device, avoiding the need of repare and replacements and, mostly, ensuring that the amplified signal is the clearest possible to the users (5). As seen, there is a variety of information that must be transmitted and demonstrated to the user of hearing aids, usually in a short period of time. This individual, on the other hand, need to understand and accurately store such information, often not familiar, for subsequent recovering and action (6). Among other factors, the anxiety caused by the situation of using a hearing aid, the lack of familiarity with the approached content in the orientation and the very presence of hearing loss difficult the understanding of the message and the retention of information. Besides, the communication skills of the professional, the strategies used to transmit the information as the amount of offered information that influence the retention process of orientations (1, 7-9). Other important point is the type of task used to evaluate the hability of the patient into retaining information of health. In the recognizing tasks the individual needs to choose the correct information among the different options provided - similar to a multiple choice test. Tasks in aided recall (probed recall) there is some type of clue or help to evocate. For example: "which is the size of the battery in your hearing aid?". In tasks of free evocation no clue is provided, for example, the individual would need to evocate the size of battery of the prosthesis in front of the question "Tell me all you know about the use and care of your hearing aid"(10). Few researches identified the quantity of retained information after the orientations at the audiologic clinic. In a study with new adult users, employing tasks of recognition, was checked that these that retained about 85 to 75% of provided information immediately or after the few months of adaptation of hearing aid. Was observed, still, that the age and severity of hearing loss slowed the retention of information (10). In another study, new adult users responded a questionnaire with 25 opened questions (tasks of aided recall) being observed in average of the retaining of information was of 80% and 77% immediately and four weeks after the adaptation, respectively (11). The observation of how the user take cares and manipulate the hearing aid and earmold provide a indirect measurement of how the provided orientation was retained and is being used. OLIVEIRA et al. (2001) (12) verified that 76% of adult new users presented some difficulty in relation to the earmolds or capsules of hearing aid (13). In the case of experienced users was also demonstrated that the level of ability of them as the manipulation and care with the hearing aid varied from excellent to bad, being the worst performances observed in cleaning tasks of the prosthesis and the use of telecoil (5). The understanding and retention of information provided by the Professional of health increase the satisfaction of the patient and the adherence to the treatment at the same time that decreases the anxiety and the time of treatment what, by consequence, decrease also its cost (3). Studies performed in older people have showed the easiness and the manipulation and care with the hearing aid and the earmold was related with the number of hours and the self perception of benefit obtained with the use of the device (14,15). By the exposure, the objective of this study is to verify how many new adult users of hearing aids can retain the offered orientations after the audiological diagnosis and the process and adaptation of the hearing aid and analyze if the factors ad age, rate of hearing loss, socioeconomic level and the scholarity present any influence in the retention of information. The present prospective study, descriptive, exploratory and transversal was performed at the Center of Audiological Researches (CAR) of the Hospital of Rehabilitation of Anomalies Craniofacial (HRAC) of University of São Paulo, being approved by the Ethics Committee on Human Reasearch (protocol 099/2005-CPq). All the participants were volunteers, agreed with the realization of the needed procedures for the execution of the study and signed the Term of Consent Free Clarified. The study involved a selected sample (not random) corresponding to the first 30 individuals attended in the service in question that accept to participate voluntarily of the research and obeyed the following criteria of inclusion: (a) have age under 18 years, (b) be a hearing impaired person of any kind and degree, unilateral or bilateral, (c) do not present visual deficiency that could not be that was not correctable with lenses, (d) not present motor alterations or alterations of manual dexterity severe, (e) not present dementia process or other neurological disorders or psychiatric (as neurological and psychological evaluation contained in the medical records of the participants), (f) not have performed audiological exams previously, whether in public service or private and (g) do not present previous experience with the use of hearing aid. The participants possessed ages ranging from 18 to 88 years, being 13 adults, (age under 60 years) and 17 elderly. 18 participants were females and 12 males. None participant had undergone by the process of audiological diagnosis previously whether is in public or private services. All presented hearing impairment post-lingual being bilateral sensorineural (n=26), bilateral mixed (n=3) and sensorineural in one ear and mixed in the other one (n=2). Twenty participants had symmetric hearing loss and 10 had asymmetric loss. The classification of degree of hearing loss was performed from the average of the thresholds of 500, 1k, 2k and 4k Hz in the best ear, according to the World Health Organization (16). All of education and socioeconomic status (17) were extracted of the evaluation form of social service that contained in medical records of the participants. The characterization of the participants is found in Table 1. The process of orientation was performed in different stages, the content being covered in each one of them described in Table 2. The participant attended to the Center of Audiological Researches in three consecutive days. In day one was performed the diagnosis, day two were made the procedures of selection and verification of the prosthesis and day three was performed the adaptation. To the realization of activities of orientation was made the transformation of the technical speech into a common speech, being used visual supports as, an example, images and specific graphics to facilitate the understanding of the message. Strategies of communication, compatible with the hearing abilities of the participants were also employed (for an example: use of lip reading, decrease rate of speech, use of repetition, rewording, writing support when necessary). The same professional performed the orientation to all the participants. A list of verification was used for this professional to approach all the necessary topics. The participants were asked to interrupt the evaluator and ask for a explanation whenever necessary. The time used for the orientation about the characteristics of hearing impairment and about the use and care with the hearing aid was similar, about 40 minutes. During a session of orientation, each one of the participants practiced together with the speech therapist and the activities of insertion and removal of the earmold / hearing aid in the ear, insertion and battery removal, operation of volume control and toggle switches (when existing) and use of telephone. The orientation of manipulation, use, cleaning and care with the hearing aid were also provided in written form (instructions of the manufacturer), enabling to the participant the reading of them, in their residence, after the adaptation. The participants returned to the service for the first consult of accompaniment, when was performed the evaluation of the retention of the provided information. The time between the adaptation of the prosthesis and the evaluation was equal to one (n=3), three (n=21) and four weeks (n=6). 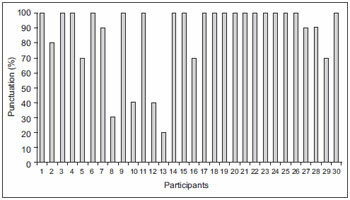 The difference between the time to evaluation occurred depending of the availability of attendance of the participant. For the proposition of this evaluation was elaborated a protocol containing general information of the model, type and technology employed in the adapted hearing aid, number of daily hours of the use of the device and the approached items in the different stages of orientation. The evaluator performed a interview with each participant, asking about the characteristics of their hearing loss and about the use and care with the hearing aid. The evaluator also performed a inspection of the conditions of use and conservation of the earmold and of the hearing aid. When it comes to characteristics of hearing loss the patient was asked to report any information that he remembered (task of free recall). The information of interest to be punctuated was referring to the severity of the hearing loss (degree of loss) and location of the lesion (type of loss). Was not expected them the use of technical terminology. The answer of the participant was registered in the protocol. Two independent evaluators analyzed such answers and had given a note. If the participant remembered correctly the information was given the punctuation of 10, if only remembered partially (for example, if remember the severity of but not the place of the lesion) was given a punctuation of 5 and in case of not remembering any of the info was given the punctuation of 0. To the evaluation of retention of information regarding the use and care with the prosthesis was used aided recall task. Were asked questions about ten items: insertion and removal of battery, duration of battery, need to keep an extra battery to exchange, removal of the hearing aid/mold, insertion of hearing aid/mold, cleaning the mold and the prosthesis, manipulation of the control of power on/off, care with the hearing aids and earmold and solving problems with the hearing aid. The participant was also asked to manipulate the hearing aid in front of the evaluator (for example, insert and retrieve the earmold and/or hearing aids, insert and remove the batteries, manipulate the volume control and toggle switches of turn on and off, telecoil, etc). This way, were considered also the verbal answer of the participant as the action demonstration. Was attributed one point to each answered item or showed correctly. 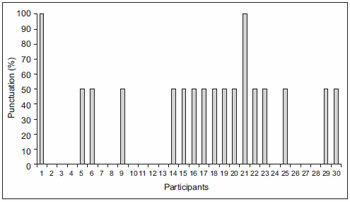 The obtained punctuations of each participant was divided by the total possible punctuation (equal to 10) and multiplied by 100, to obtain the percentage of retained information. Regarding the manipulation of the volume control, this item was analyzed separately because there is 18 participants that used the intracanal hearing aids with the control of volume being automatic. The data analysis was performed by means of descriptive statistics. Were also performed comparisons of the average of punctuations of recognition of information between men and women, between adults and elderly and between the users of intracanal prosthesis and retroauricular (T test). Were verified the correlations between the degree of hearing loss (Pearson correlation coefficient), scholarity and socioeconomic level of the participants (Spearman correlation coefficient) and the punctuations obtained by the individuals during the evaluation. For all cases was adopted alpha = 5%. The Graphic 1 show the results obtained in relation to the retention of information about the characteristics of hearing impairment. Regarding the number of hours of use of the hearing aid, 22 participants (73,3%) used them for over 10 hours and 8 participants (26,7%) used them for about 4 hours daily. Of these last one, one individual did not used the prosthesis during his workday, once the environment presented a lot of humidity and dust, and three individuals still were in the period of acclimatization to the amplified sounds. The Graphic 2 show the distribution of the obtained punctuation to the items of use, care and manipulation of the hearing aids and/or earmol. Regarding the manipulation of the control of volume was performed by the 12 users of retroauricular hearing aids, was verified that 9 participants (75%) performed adequate manipulation and three (25%) did not remembered the function of control and, so, did not manipulated although they felt the need of increasing and reduce the amplification in some environments. The difference between the average of punctuation of use and the care with the prosthesis between the users of retroauricular devices (x=8,3; dp=2) and intracanal (x=9,1; dp=1,2) was not statistically significant (p=0,12). The average of the punctuation among adults and elderly as the statistical significance between them (T test) is found in Table 3. The table 4 show the correlations obtained between the scholarity, socioeconomic classification and degree of hearing loss of the participants with the retention of information about the characteristics of the hearing loss and the use and care with the hearing aids and earmolds. * The options of treatment were discussed together with the otorhinolaryngologist doctor. In average, the participants could retain 31,6% (dp=30) of information about the characteristics of their hearing loss (Graphic 1). Was verified that only two individuals (6,7%) could evoke 100% of the provided information, including the etiological hypotheses. 12 participants (40%) could evoke only the severity of loss. The analysis of the registered answers showed to be common the reference to a percentage of the hearing loss, although this information was not provided in the session of orientation: "(.) i lost 60% of the acute"; "it is a loss of 50% in both ears"; "(.) is light, I lost about 10% of hearing (.)". Three participants (10%) could evoke only the place of the lesion "(.) is in the cochlea cells". "the problem is in the inner ear", "(.) perforation in the tympanic and also in the cochlea". Of a particular importance was the fact that the 13 participants (43,3%) could not evoke correctly any information about the characteristics of their hearing impairment. Until the conclusion of this article was not found others researches about the retention of information about hearing loss. The analysis of literature in other health areas shows that is common for the patients to not retain information about the diagnosis of a disease, even when is a life threatening one. In the oncology area it was found that ten days after the diagnosis the patients could evoke 50% of the provided information (18). Besides, a research in the medical emergency area observed that about 80% of the patients wrongly understood the diagnostic information provided without, however, being aware of it (19). Regarding the information about the use and care with the hearing aids, in average the participants evoked 86,3% of information (Graphic 2). It is noteworthy that the insertion and removal of the battery and seal was the item where the patients had more difficulty, being only 14 participants (47%) capable of evoke the information correctly. Because of the methodological differences was not possible to make a direct comparison of the present study with the literature, however, the data here reported are in agreement with other studies with new users of HA where were observed retention of information of 77 to 85% (10,11). The participants evoked a greater number of information about the use and care with the hearing aids than about the characteristics of their hearing impairment. One of the factors that contribute to this result was the type of task used in the evaluation. The level of difficulty associate with a given task is attributed to how many efforts are needed for the recovery of the information. So, tasks of free recall are the hardest than the ones with aided recall (11). Other factor that may have contributed is the impact of the diagnosis of hearing impairment that, frequently, generates in the individual sense of shock, pain and stress (20). This feelings contribute for the narrowing of attention (8) complicating the absorption of information and making that the individual remember only the more important data for his whole life, this message may have become the focus of attention of the individual and the information "secondary" like, an example, the result of the exams made, are not processed and stored in the memory. The order and context of the presentation of information can also have affected the result. Were not offered written material, like, for example, leaflets about the hearing impairment, and test results for the patients to retake the information in another moment, which may have hindered the retention of the same (21). Also must be emphasized that the individuals have more facility to retain concrete information than abstract information and when the topics are presented in a explicitly and structured way (7,8). Even though the illustrations are facilitators, the content of the orientations about hearing impairment is more abstract than the orientation about the use and care with the hearing aids and earmolds, since they could be visualized and manipulated by the participant. The evaluation from the participants of this study did not occur immediately after the providing of information. This way, is impossible to be certain about the effect that the daily experience with the use, care and manipulation of the hearing aids and earmolds had over the retaining of the given orientations. However, like the most of the participants used their hearing aids effectively in the period that preceded the evaluation is plausible to affirm that they were much more familiar with that content than to their impaired hearing ability. Adults evoked significantly more information than the elderly about the hearing loss, but not about the care and use with the prosthesis. This may have occurred also based in the task used (free recall x aided recall). REESE e HNATH-CHISOLM (2005) (10) also did not found influence from the age in the amount of retained information about the use and care with the hearing aid when recognitions tasks of information were used. Researches in other areas of health where was used the free recall also found even worst results to elders (22, 23). Elders have worst memory to events or facts (episodic memory) and can be resulting of the decrease of cognitive ability related to age. It is suggested that the difficulty of elders is found in the codification process and storage of information (8). Was not observed significant correlation between education, and socioeconomic classification, with the amount of evoked information. Other studies showed the increase of retaining of information with the increase of education (22,23). In the present study the influence of education may not have been observed as a function of the sample was relatively homogeneous, this is, 50% of participants had at maximum the basic education. The same may have occurred in relation to the socioeconomic classification, since 63% of participants were in the higher lower class. Because the information has been transmitted orally one of the hypotheses raised in this study was that the severity of the hearing loss could reduce the retention of information because it hampers the process of reception of the message. However was not observed the correlation between the degree of hearing loss and the amount of information evoked by the patients. Such fact may occurred because the sample is composed mostly by individuals with hearing loss in a moderate degree or, still, because of the communication strategies used by the professional were efficient to compensate the hearing difficulty and, consequently, transmit the needed information. The retention and understanding of information about the characteristics of the hearing deficiency and the use and care with the hearing aids and/or earmolds allows that the new users of these devices can extract the maximum advantage of them and also of the rehabilitation process. There is a great number of researches about how to improve the recalls of given orientations from the health professionals. Was demonstrated, for example, that the retention of information increase when the professionals use a more accessible language, recognize the importance of counseling and its clinical practice and have a greater self critic about their capacity of transmit information. Also there is a increase of a retained information when the provided orientation are compatible with the priority and providing of educational material (leaflets, videos, websites) for later reference (7-9, 21). Graphic 1. Distribution of the obtained punctuation as the retention of orientation regarding the characteristics of hearing loss (n=30). Graphic 2. Distribution of obtained punctuation as the use, care and manipulation of the hearing aids/earmolds (n=30). The present study showed that there is a loss of the provided information about the use and care with the hearing aids and about the hearing loss, and this last one is bigger for elder individuals. Is necessary the use of strategies that facilitate the retention of this orientation. Besides, is important the realization of other researches to investigate the influence of demographic data, like education in the process of retention of the information. 1) Specialist in Clinical and Educational Audiology - HRAC/USP. Speech Therapist, Health Politec. 3) Phonoaudiologist.Student's Master's Program in Phonoaudiology of Odontology College of Bauru - University of São Paulo. Article received in February 14th of 2011. Article approved in August 18th of 2011.